Swiss police have apprehended a man who stormed into a health insurance company's office with a chainsaw and injured two people on Monday, one seriously. The perpetrator, who has a criminal background, was captured following a large-scale manhunt. 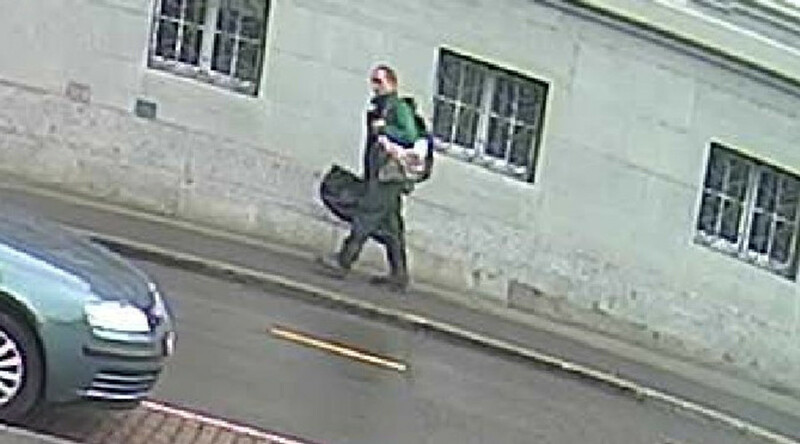 The man, identified as 50-year-old Franz Wrousis, was arrested in Thalwil on Tuesday evening, after running away from the crime scene in Schaffhausen, a medieval Swiss town some 60 kilometers (37 miles) from the German border. "The suspect, who is thought to have injured two people with a chainsaw, was arrested this evening by police from the canton of Zurich," police said in a statement, as quoted by Deutsche Welle. Although the incident was not at any point treated as a terrorist attack, a wide-ranging international manhunt was launched amid fears that Wrousis, who was reportedly living rough in the forest, could slip into Germany. 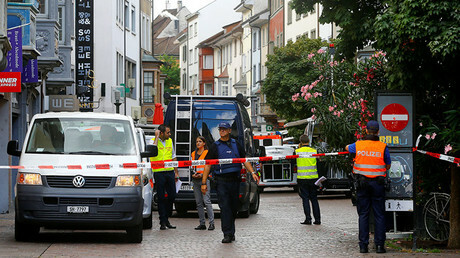 Parts of the old town of Schaffhausen were put on lockdown following the Monday attack, due to what police called a "special situation." Later on Wednesday, law enforcement officials told a news conference that Wrousis had two loaded crossbows and two sharpened wooden slats in his possession when he was apprehended, but that he did not resist arrest. The chainsaw has not yet been found. Police managed to track and arrest the suspect following numerous tip-offs from local residents, prosecutor Peter Sticher said, adding that the operation to catch Wrousis involved 50 to 100 officers. German police deployed helicopters to the area adjacent to the Swiss-German border in a bid to track down the assailant. An international arrest warrant was issued for Wrousis. The minivan which Wrousis is believed to have used to flee the scene was found on Monday evening. Wrousis was already known to law enforcement for repeated weapons offenses, for which he was detained in 2014 and 2016. He was considered a threat to public safety while on the loose, and it was suspected that he could have been in possession of arms. Details of Wrousis' detainment are still unknown, with police promising to reveal further details later on Wednesday. The man was described by those who saw him as being mentally unstable and aloof, living a reclusive way of life mostly in the woods. "This is a dangerous and aggressive man," said Ravi Landoldt, chief of security in Schaffhausen, as quoted by Deutsche Welle. However, not everyone who knew the suspect considered him a threat. Although Wrousis' motives were not immediately clear, the Swiss health insurance company CSS, whose offices he raided, said he was a client. As a precaution, CSS shut down all of its offices in Schaffhausen, as well as in nearby towns. In addition to the two people injured by Wrousis, two customers received treatment for shock. Another person was slightly injured as police were responding to the incident.